Last year, on April 6, 2013, the first meeting of the Berryessa – North San Jose Democrat Club was held. It is a fledgling club whose purpose is to increase the presence of Democrats in the area. Since I am for that, I joined. At one of our meetings, the subject of which candidates our new organization was likely to support came up. Kansen Chu, Bob Wieckowski and Mike Honda were names that came up for various offices. I asked if anyone else was running. And, really, there wasn’t. I mean, there were some competitors, but no one for whom I was interested in voting. But one of the people at the meeting named some Indian guy who was going to be running against Mike Honda. It got my attention because I have long been interested in challengers to his office. I would never consider a GOP candidate, but a viable Democrat is of interest. Nothing against Honda, I just do not think we should have a coronation every two years. It was the intention of our forefathers that it be an election, with debate on the issues. So, I figured Mr. Indian Dude was dead in the water. A couple of months passed and my phone rang. Some young lady with an Indian-sounding name was inviting me to meet some guy who was running for Congress. I guessed it was the person discussed at the meeting. Now, I have been known to be a bit fiesty. And, age has not changed that in any way. I decided to go and meet this young challenger. I was expecting an arrogant person with a chip on his shoulder trying to get my vote lest I be painted a racist. Oh, boy, did I eat crow! What I discovered was a highly intelligent, thoughtful and very accompished young man who actually cares about people and getting things done. His name is Ro Khanna. I grilled this poor guy on every subject that I care about: abortion, labor unions, wages, education, taxes, you name it, I brought it up. Try as I might, I couldn’t find anything wrong with him. Honest, I really TRIED. 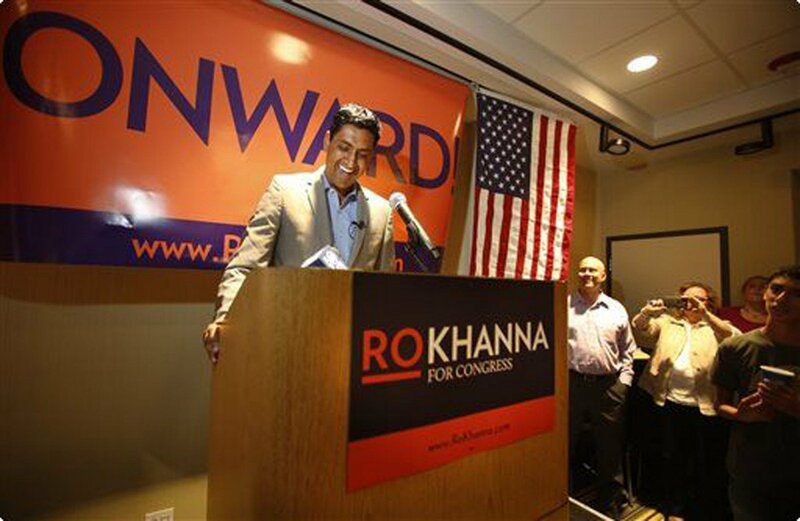 To my delight Ro Khanna never ONCE said anyone should vote for him because he was an Indian American. It never came up. Not once. Well, not by him. Another Indian American at the meeting mentioned that Ro Khanna would be the first from that ethnic group in Congress (or maybe from this district — I do forget that particular detail). But that is appropriate. While it is inappropriate for a candidate to ask for my support because he is a member of any particular group, there is nothing wrong with a supporter, and member of the same group, to have pride in the fact that someone from their group may achieve something wonderful. That’s just human nature. But, it was Ro Khanna’s accomplishments that got my attention, as well. He has worked in the commerce department. He teaches economics at Stanford and law at Santa Clara University. He has written a book about the new economy and labor union leaders support his ideas. There are two major differences between Ro Khanna and Mike Honda. First, Ro is better trained to deal with technology issues that effect this district. That is kinda HUGE. We have Apple, Intel and several other high tech companies in this congressional district. Yes, congress people represent citizens, not business. I get that. But they still have to understand how the businesses work and what their needs are in order to keep jobs from going overseas. Honda doesn’t get that. At least not that I can see. The second difference is rather superficial, but also important as a tie-breaker. When Honda speaks, I want to go to sleep. He is not capable of giving an inspiring speech. Ro Khanna, on the other hand, IS. When he speaks, I feel inspired to do better as a person. To work harder to make my country and my community better. Now, if Ro were incorrect in his positions on important issues, this would not be worth considering. These men are asking you to send them to the Congress of the United States of America. You know, where there is debate on the open floor of congress. Where a person MUST be inspiring in order to make his case to get a bill passed. I have confidence that Ro Khanna can do this. I have none that Honda can. Honda has managed to get one bill passed in 14 years that he wrote himself. That was to name a post office. California’s 17th Congressional District has an opportunity to change its leadership to something better. In the past, I have voted for whoever the Democrats ran because the alternative was some GOP crazy dude. 1) Ro Khanna should not run because it takes away from money we can send to candidates in other states. Until today I have given more money to other candidates than to Ro. I only gave money today because Honda’s tactics really ticked me off. Here’s a thought, if there had been MORE debates, a LOT less money would have had to have been spent PERIOD. So, if Honda had merely agreed to several debates over several months, people could have made their decision based on those performances and not some self-serving mailer. 2) Ro Khanna hasn’t started at the bottom and worked his way up in local elections. SO? While most of the time I would agree that previous elected political experience is necessary, there are ALWAYS exceptions to those rules. Khanna’s time in Washington as Deputy Commerce Secretary certainly is just as important as being on a local school board and attending club meetings. 3) Ro Khanna is going against Mike Honda and Honda is such a nice guy. So? Ro is a nice guy, too. Congressional candidacy is not supposed ot be a popularity contest. It is supposed to be about the issues of the day. 4) Ro Khanna runs all the time against old people. He moves around to challenge the old people. Ten years ago, Ro ran against Tom Lantos and lost. He hasn’t run since. He is NOT a perennial candidate. He ran ONCE before. He no longer lives in San Mateo, he lives in Fremont. No reason to run there. AND, um…show a Bay Area congressional person who is under 60. If Ro Khanna is going to live in the Bay Area, who can he run against that hasn’t been in office for over a decade? So, he can’t run because it might look like he is picking on old people? No one should ever run in the Bay Area if that is true.